Mahmoud Ahmadinejad and Mohammed Morsi, arguably the foremost exponents today of Sharia rule, both spoke at the United Nations General Assembly on Wednesday, and their speeches together amounted to an Islamic supremacist wish list for the world. The foremost item on their list, not surprisingly, was the destruction of Israel, although both knew better in the glare of international media than to state their aspirations quite so baldly. And how can we work together for building a better life? Ahmadinejad ticked off a list of things that he posited had interfered with international brotherhood and harmony, including “egoism, distrust, malicious behaviors, and dictatorships,” as well as the Dark Ages and the Crusades (although he didn’t mention the centuries of murderous jihad warfare all over the globe). His list culminated with his principal bogeys, the chief things he believed interfered with global peace: “the occupation of Palestine and imposition of a fake government”; Saddam Hussein’s “invasion” of Iran; 9/11 and the subsequent U.S. military actions in Iraq and Afghanistan; and a host of others. Among them, he complained about the supposed denial of “the right to criticize the hegemonic policies and actions of the world Zionism.” It was hard not to wonder at such moments in his speech what planet he was on, since the Palestinian jihadist propaganda machine has had such success in demonizing Israel in the world media; but of course a linchpin of that success has been to complain that the situation is exactly the opposite, and so that is what Ahmadinejad did in New York Wednesday. In a speech that was heavy on Islamic proselytizing, after his survey of the world’s ills Ahmadinejad asked: “Does anybody believe that continuation of the current order is capable of bringing happiness for human society?” And further: “Who is responsible for all these sufferings and failures?” He left that question unanswered at that point, although at another point he railed against the “uncivilized Zionists,” and he went on to delineate his prescription: “There is no doubt that the world is in need of a new order and a fresh way of thinking.” Foremost this would be “an order in which man is recognized as God’s Supreme Creature, enjoying material and spiritual qualities and possessing a pure and divine nature filled with a desire to seek justice and truth.” Consequently he called upon the nations to “place our trust in God Almighty and stand against the acquisitive minority” – in other words, to adopt Sharia and stand against Israel. Morsi also added an additional item to Ahmadinejad’s laundry list for global harmony: the eradication of “Islamophobia.” “We must join hands,” he said ringingly, “in confronting these regressive ideas that hinder cooperation among us. We must act together in the face of extremism, discrimination, and incitement to hatred on the basis of religion or race….We have a responsibility in this international gathering to study how we can protect the world from instability and hatred.” How could this be done? Egypt, he said, “respects freedom of expression,” but only such expression that is “not used to incite hatred against anyone” and that is “not directed towards one specific religion or culture” – a freedom of expression that “tackles extremism and violence,” not the kind that “deepens ignorance and disregards others.” In other words, he was calling for international restrictions on speech that Muslims find objectionable. Destruction of Israel and of the freedom of speech, both couched in high-flown terms that eluded most of the hearers and much of the international media. But the intentions of both of these Islamic supremacist presidents was clear. More’s the pity that there was no voice of freedom to stand up and defend free states, free speech and free people in terms just as clear. 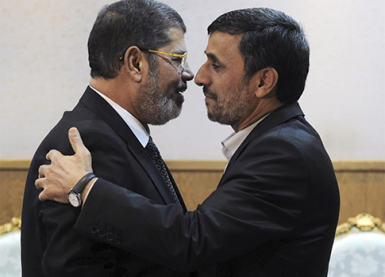 And because of that lack, Ahmadinejad and Morsi may well get what is on their wish list. Previous Previous post: Barack Hussein Obama Will Stand With Muslims!